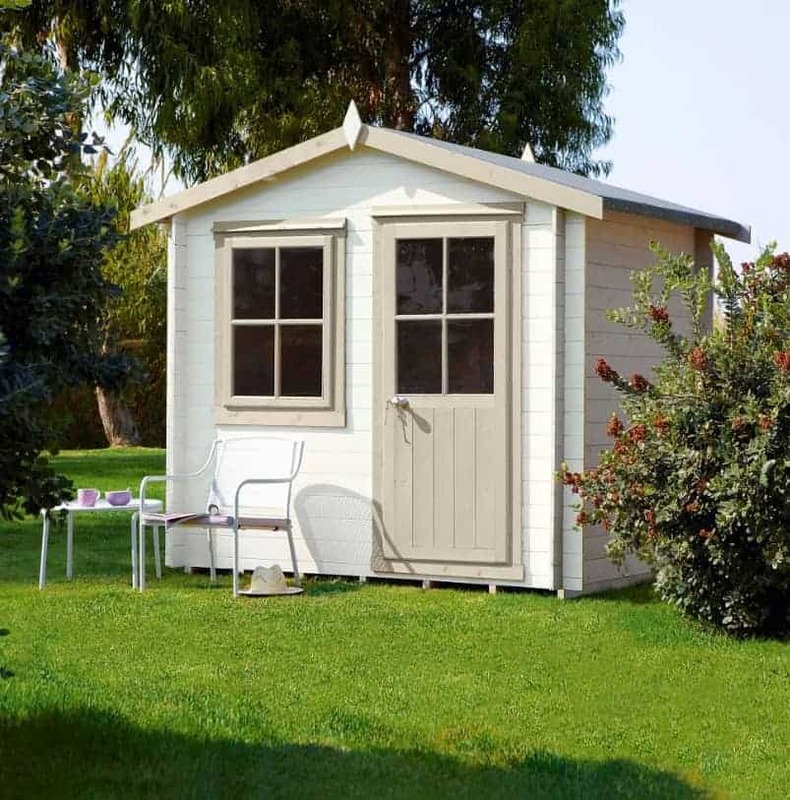 The Hartley 8X6 Tongue And Groove Timber Log Cabin is a delightful compact log cabin and will not take up a whole lot of space in your garden, so you could use this as a workshop, summerhouse or just for some extra general storage. 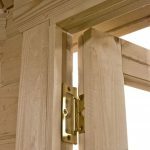 It is constructed out of strong tongue and groove wood and has a functional opening front window to allow in fresh air and a tall door for easy access. You could choose to spend hours inside, relaxing and escaping the outside world. This handsome looking building will be a beautiful feature for any garden that it is placed in. This product is home delivered with assembly for your convenience. 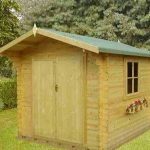 This is one very well made log cabin that is both incredibly good looking, but also very strong and long lasting. To go along with that smooth looking, tongue and groove shiplap cladding. The floor and the roof are made with thick, tongue and groove boards which give the inside a great look and also make it very strong. Actual glass windows have been used which helps add to the high quality look of the cabin. Under the flooring are a set of pressure treated floor joists which will not only keep the log cabin from sitting on the floor, but also help the overall strength of the structure. Here we have one of Blooma’s more high end log cabins. 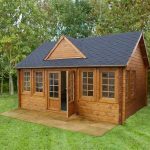 This is the smaller version of this cabin and it is perfect for those of you with limited space, but who want to have a really classy cabin on their property. It has just such a classy and awesome look to it that it is impossible not to be impressed with the design. 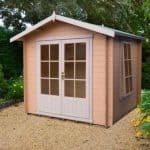 Blooma have done just an incredible job with this and we feel that this would work just as well as a workshop where you can tackle all kinds of DIY projects as it would a log cabin where you just kick back and relax. The inside of the cabin is not the largest we have seen as the width is 7 feet 8 inches and the depth 5 feet 8 inches, so you will have to carefully plan out how you are going to organise things so that you get the most out of this space. The headroom offered in here though is fantastic as along the ridge it is an impressive 7 feet 5 inches. This version of this log cabin has the same kind of roof as its big brother and that is a very interesting looking apex style roof. Blooma have made the decision to make this a bit of a shallower sloping roof which we really like as the rain is still going to roll right off it, but it also gives it a more interesting look than what you get with a standard apex roof. Making up the roof are some very strong and lovely looking tongue and groove boards which are covered with high quality roofing felt. One thing that we love about this roof is how on the inside there is a large beam that runs along the middle of it which helps give the inside that log cabin look Blooma were going for. This log cabin has some of the best looking cladding we have ever seen. It is just so smooth and locks together so well that it makes for one of the most robust and gorgeous log cabins we have seen in quite some time. 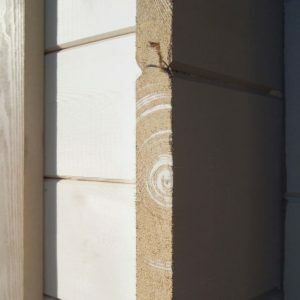 The tongue and groove shiplap cladding which is made from timber that has been, planed nice and smooth and the way it is connected together does not allow any rain inside at all. While this really is some of the most practical and well made cladding we have seen, as shallow as it sounds, we really cannot get over how amazing it looks. The way the cladding is made actually does away for the need to have a big bulky frame inside the log cabin. This sounds like it is them cutting corners or that it would lead to problems later in the structures life, but that is not the case at all. The cladding is so well made that this is actually an incredibly robust log cabin as it is and the lack of a frame that sticks out means that you are getting a few more inches of space around the cabin. A few inches may not sound like a great deal, but as this is already a compact sized cabin, every inch of space counts. The flooring inside here is designed to take quite a bit of weight so this would be perfect for a large couch and an entertainment centre. The floor is made with 12 mm thick, tongue and groove boards. Let us tell you that all the tongue and groove boarding used in side here and the wall cladding makes the inside of here look truly amazing. Under the floor, Blooma have used a set of pressure treated floor joists to enhance the overall strength of the floor and to keep it from sitting directly on top of the ground. 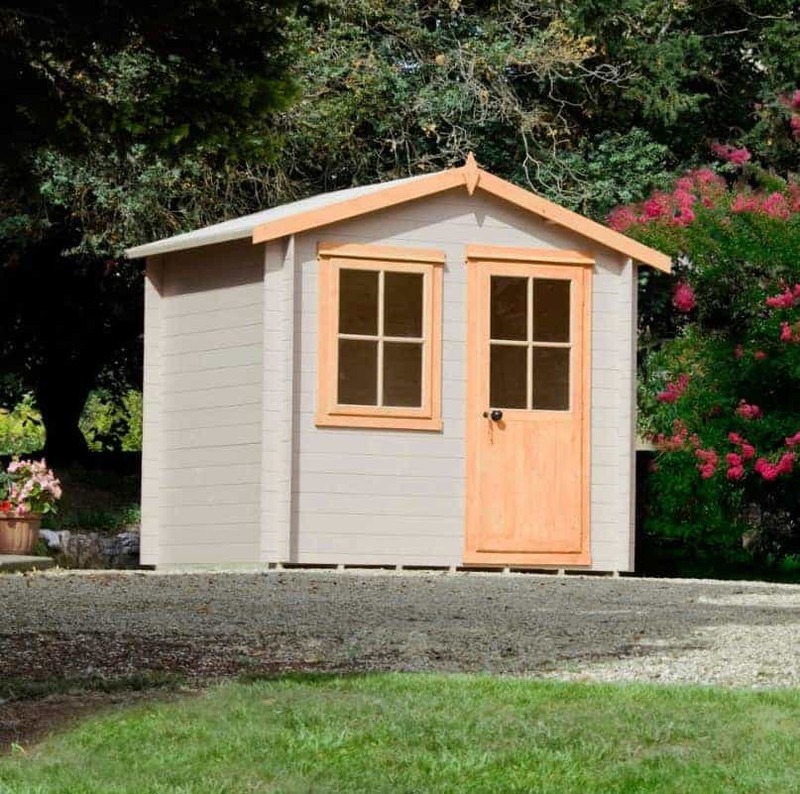 The Hartley 8X6 Tongue & Groove Timber Log Cabin looks so great that we think the government should step in and make anyone who buys it, be legally required to give it a coating of wood treatment to ensure that gorgeous wood stays rot free. Being serious, you will want to treat the cabin within a couple of weeks of installation. Once a year a fresh coating of wood treatment should be applied in order to keep the cabin looking sleek and amazing. As long as you treat the cabin the way they instruct you to then you will be given a very generous, 10 year anti rot guarantee. There is a single sized door on the front of the cabin and we feel that this door is perfect for the cabin as it is just the right size where it makes getting items in and out easy, but it does not take over the whole front of the cabin. The door has a great design with a large window and a proper handle complete with an actual lock. The door hinges are very strong and will stop the door from sagging. They are also hidden so that you cannot see them which is something we really like. Along with the window that is on the door there is only one other window on the whole log cabin. This is located on the front of the cabin and it can actually be opened so you can get a bit of fresh air in there. Both windows are made from high quality glass which is something we always like to see on a structure like this. We do wish though that they had put at least one other window on one of the sides of the cabin. 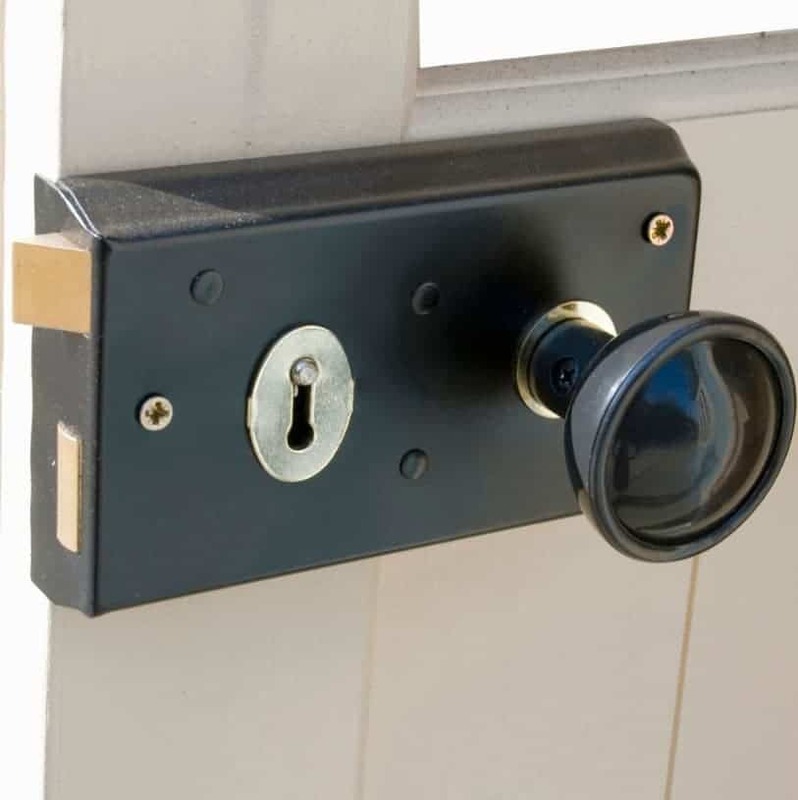 With its very sturdy and solid design, plus the fact they have installed a proper lock on the door. This is one of the more secure log cabins that you can buy. Any expensive belongings that you store in here will be safely locked up. You actually do get quite a bit of privacy with this cabin as there are only two windows on the front of it. If this is still a bit open for you then you could always use a set of blinds or curtains. As you are required to treat that lovely looking wood have a think about using a wood treatment that is coloured. This is one way to give the cabin a little bit of your own personality and also make sure it fits in with the other things that you have in your garden. If you wanted to go all out then you could always paint the whole cabin in some pretty wild and out there colour or design. 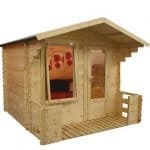 You have no extras to worry about with this cabin and the assembly service is actually already included with the price. This is one incredible looking log cabin and the quality of it is just as impressive as its looks. This is something that is going to last you many years so you are going to get a lot of enjoyment out of this. While the structure is very strong, you will be responsible for keeping it free from rot by treating it. 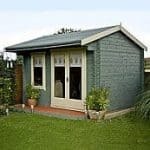 This is one of the smaller log cabins that we have seen, but it just means that this is ideal for those with a small garden who want a cool place to relax. No worries about smashing the windows, cracking a wall or even breaking your thumb as this will be assembled for you. This is most certainly something of a luxury log cabin, but it does come with a price that reflects this. If you want high quality though, you have to pay for it and high quality this certainly is. 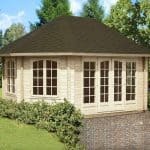 Final Thoughts: The Hartley 8X6 Tongue And Groove Timber Log Cabin is one very well made and just fantastic looking cabin that is going to give you many years of enjoyment. While it is on the small size it is still very large on quality and charm. 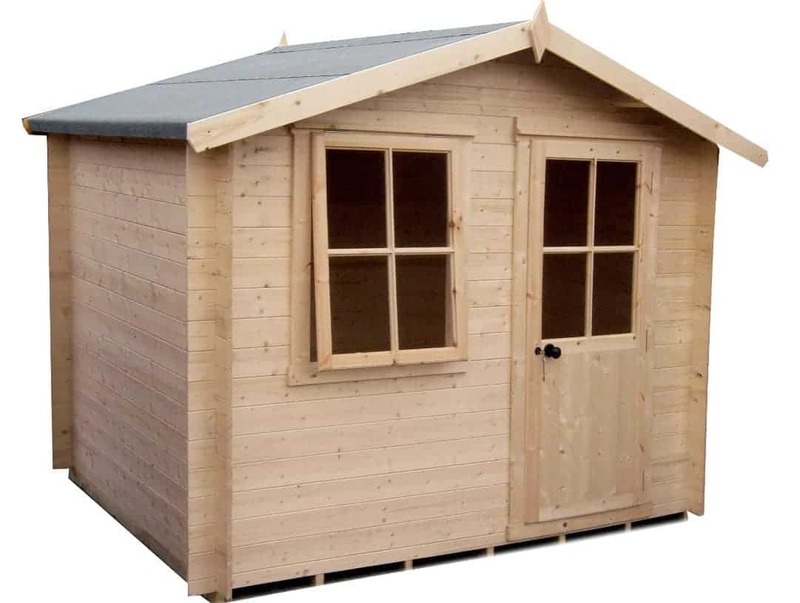 If you do not have a whole lot of space, but want a classy and top of the line log cabin then honestly this is one of if not the best one you can buy. The included assembly service does raise the price, but it also means that you are guaranteed that the cabin will be installed properly. This is a fantastic log cabin and you feel that if you are fine with the asking price that you absolutely love this.